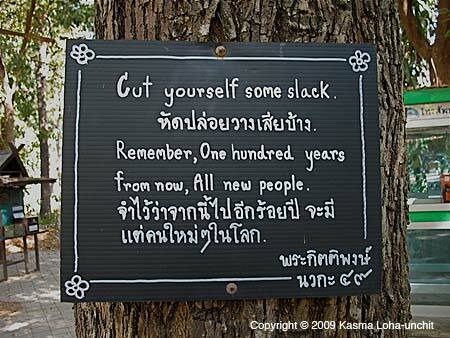 Sayings such as this one are often found on the grounds of many temples and forest monasteries in Thailand. They are meant to cause the reader to reflect outside of the ordinary cares of life. I particularly like this one. It puts our daily upsets and concerns in a different perspective: after all, in 100 years no one will know a thing about them. Cut yourself some slack! For more on Thai Buddhism read Buddhism, Thailand, Achaan Chah or Buddha Images in Northeastern Thailand. 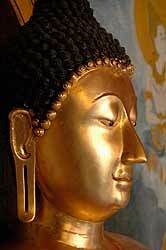 I’ve been interested in Buddhism for many years. For the past several years my practice has consisted largely of reading books of the teachings of a Thai forest monk named Ajahn Chah and using his teachings as a basis for contemplation and meditation. One book in particular, A Still Forest Pool, has many passages that I’ve read over and over again. 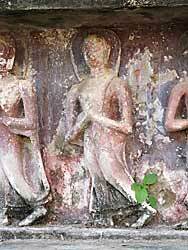 I’m attracted to the simplicity of the teaching; it sometimes seems that if I could really understand the teaching in one of the chapters or even one of the paragraphs, that I would understand the essence of Buddhism. I began noticing all the examples of times when my behavior appears to be conditioned. There are so many examples. Suppose I have a doctor’s appointment and when I get there I’m told that I have to wait 45 minutes to see the doctor. One response would be to get angry and to storm out, upset that the doctor considered me of so little importance. Another response would be to be happy because I have an extra 45 minutes to read a book that I’ve been wanting to get to. I began to see that my entire life is made of of situations where I react based on prior conditioning. This being the case, instead of simply reacting blindly to every situation, I have the choice of stopping, watching and deciding how I want to respond. Of course it’s not just this easy. All of our unhappiness and dissatisfaction comes from wanting situations or things to be different than the way they are. The teachings of the Buddha, passed on through these two monks, tells us that we should not rely on any conditioned reality because all conditions are impermanent and therefore constantly changing, arising and dying. Ajahn Chah often reminds that it is not enough to merely understand this intellectually; we must experience it and that meditation is necessary for this. I’m very much a beginner at meditation, after doing it on and off for many years. The very first year I went to Thailand, I did a 10-day meditation retreat at Suan Mokh (The Garden of Liberation) in the south of Thailand. It was 10 days of silence and meditation. The insights from those 10 days still are with me. At the retreat, all of our needs (food, shelter, clothing) were adequately (if not extravagantly) taken care of: we really didn’t need anything other than what we already had. In those circumstances, it became very clear that if I was unhappy, that the unhappiness resulted from my own mind, not from anything around me. The other thing I noticed was how quickly states of mind can change. Sitting in meditation my mood could switch from utter contentment to complete restlessness and boredom in (literally) the blink of an eye. A previous post on this subject was named Buddhism, Thailand, Achaan Chah. If you are interested in exploring the teachings of these two monks, a good place to start is at the website of Abhayagiri Monastary. Written by Michael Babcock, August 2009. Thailand is sometimes described an one big open air food market. Among the delights that you might come across are these chive cakes photographed at a street vendor near Thong Lo, which is what Sukhumvit Soi 55 is called. When you buy them from a vender, he cuts them up with a pair of scissors and tosses them in a plastic bag, along with a black soy dipping sauce and a skewer or two for spearing the bites. 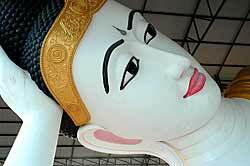 The Thai name is Kanom Gooy-chai. We have more market pictures on the website. For more on the Thong Lo street food scene, see One Soi’s Street Food Scene. 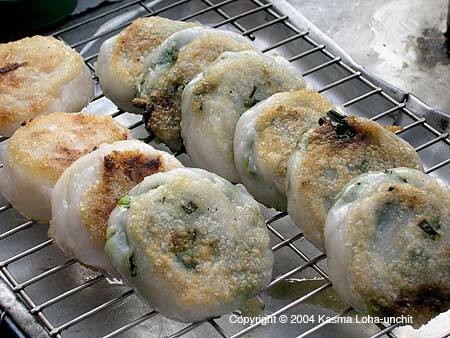 You can learn to cook this recipe in Kasma’s Advanced Thai Cooking Class D-3. Stir-frying is a quick-cooking method that is similar to the western way of sautéing, in which relatively small pieces of food (usually bite-size) are tossed about quickly in a hot pan with a small amount of oil. High heat must be maintained throughout the stir-fry for proper searing of foods to seal in their natural juices. 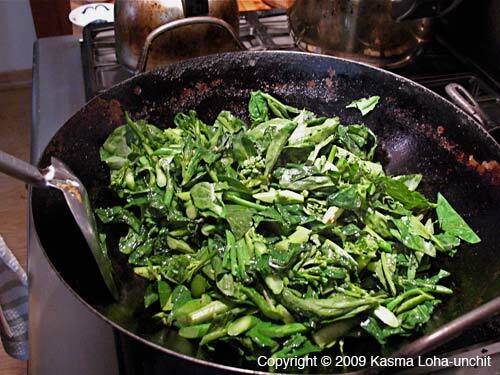 Although stir-frying can be done in a flat skillet or large pot, it is best accomplished in a well-seasoned wok. 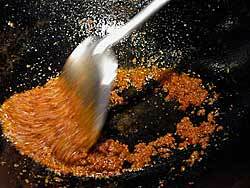 See my article on Using a Wok. I do not recommend non-stick pans for stir-frying, because they do not hold heat very well and are not oil-friendly. Cooking oil does not distribute over their surface but tends to bead here and there; as a result, food does not get evenly seared and flavored with it. As for electric woks, I do not regard them as woks at all. Not only do they have a non-stick surface, the heating element covers only a small area on the bottom, so the rounded contour of the pan never gets heated for effective cooking. For more on this see Wok: Flat or Round Bottom? Because a stir-fry proceeds at a rapid pace, make sure you have all the ingredients ready before beginning. Place them in separate piles by the stove in the order that they are to go into the wok. Unlike some styles of Chinese cooking, Thai stir-fries are seldom thickened with cornstarch or other thickeners, but instead, the sauces and seafood juices are left natural to preserve the fresh flavors of the herbs and intensity of the seasonings. Should a lot of juice cook out from seafood because insufficient heat is maintained during the stir-fry, the cooked seafood may be removed with a slotted spoon and the sauce reduced over high heat to thicken before recombining with the seafood. Stir-fried dishes, when properly done, should have just a small amount of richly colored and naturally thick sauce surrounding the pieces of seafood. If the seafood is swimming in a pool of liquid, the flavors in the dish will be diluted. On the other hand, if your stove is an especially hot one, reduce heat or add a little cooking liquid to help in the stir-fry so that the seafood does not burn and leave you with a very dried-out dish. This situation, however, is rare with most American home stoves. For stir-frying, nothing can match the wok and its companion spatula. Although a flat skillet may be used, you can toss food particles much more vigorously and with greater ease and satisfaction on the rounded surface of the wok without having to worry about splattering and spilling onto the stovetop. Food is cooked more evenly and is less likely to burn, your arm is less tired and your stove remains much cleaner after stir-frying than when a flat skillet is used. 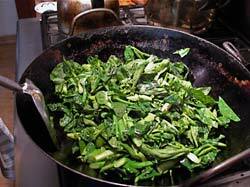 Try stir-frying a big batch of leafy greens, or big chunks of crab in the shell, and you’ll see what I mean. For a successful stir-fry, always begin by heating the wok before adding anything to it. Wait until the surface literally lets off wafts of smoke – about three minutes over high heat. (You may also test the heat by sprinkling in a few drops of water – they should sizzle and turn to steam without hesitation.) Then swirl in the oil to coat the surface, using the wok spatula as needed to spread it around, and wait a short while longer to allow the oil to get hot (about 15-20 seconds). Now you may begin your stir-fry. The rule-of-thumb is: always add cold oil to a hot wok and never cold oil to a cold wok. Preheating opens up the pores in the wok, so that when oil is swirled in, they absorb some of the oil and become seasoned before each stir-fry, lessening the likelihood of food sticking to the wok’s surface. If you do not have a very hot stove, preheating also ensures that as high a heat as possible is maintained throughout the stir-fry for proper searing of food. 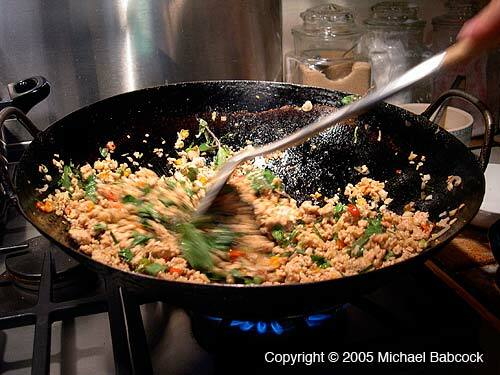 If oil is added to the wok before heating, it will burn and smoke before the wok is thoroughly heated, giving a false impression that the pan is hot enough to begin the stir-fry. And if you do, you will likely burn the garlic only to find that when the bulk of the seafood is tossed in, the heat fizzles out quickly, causing the seafood to sweat out most of its juices. When the oil is hot, add the garlic – it should sizzle but not burn. 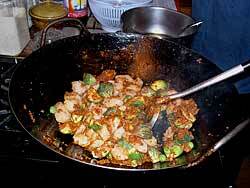 Stir for a few seconds to flavor the oil, then follow with the seafood and other ingredients to be stir-fried. Toss frequently, making sure all the food particles, large and small, get turned and moved around so that they cook evenly and do not burn. Listen to the sound of food cooking in your wok. The sizzling should be loud and lively. If it slows down, slow down also on the stirring as this can dissipate heat. Spread the food up along the heated sides of the wok rather than lump them in the center, making use of as much of the heated surface of the wok as necessary. Stir just enough to cook and brown food evenly and prevent burning. If you stir too much while the wok is losing heat, your seafood dishes will likely turn watery and the flavors will become diluted. 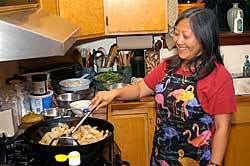 For an average home-stove, try not to stir-fry more than one to one-and-a-half pounds of seafood at a time. It also helps if the seafood is well-drained and not icy cold from the refrigerator – let it sit out at room temperature for at least twenty to thirty minutes before beginning the stir-fry. Here are a few other suggestions should your stove be less than ideal in terms of heat: (1) add the salty seasoning towards the end of cooking; (2) if there is more than one liquid ingredient, do not add them together, but space them out by fifteen to twenty seconds so that one gets to heat up and evaporate some before another is added; and (3) sprinkle the liquid ingredients directly on the hot metal just above the seafood being stir-fried so that they are heated immediately and reduced quickly to concentrate their flavors. Stir-frying in a wok has the additional advantage of requiring less oil than a flat skillet because of its rounded bottom. While one wok can stir-fry a small or large quantity of food, different-size skillets often are needed to cook widely varying quantities. Check out Kasma’s Thai recipe index for plenty of stir-fry recipes. Written by Kasma Loha-unchit, August 2009. 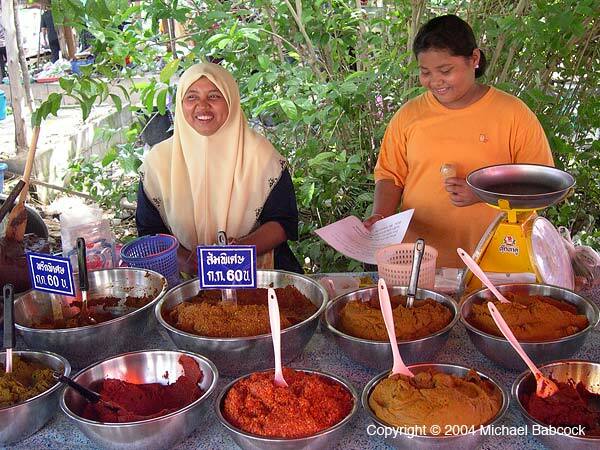 The markets of Thailand are filled with colorful, delicious looking ingredients and finished food. By far the best part of the markets are the vendors themselves. These two young women are selling curry pastes at the Sunday market in Nakhan Si Thammarat, in southern Thailand. It’s a lively and extensive market and well worth a visit. We go and graze our way through the market – there’s plenty of prepared food as well as ingredients for any Thai dish you could imagine. We have more market pictures on the website. If you’re in Nakhon Si Thammarat, try Wang Derm for breakfast! This week we’ve got another durian picture from Or Tor Kor Market (pronounced Aw Taw Kaw) in Bangkok – one that will show you how this delectable fruit is encased in the very spiky outer-shell of the durian. It’s a companion to last week’s photo, showing durian for sale at Or Tor Kor Market in Thailand. Never go to sleep under a durian tree! They weigh several kilos and would really hurt if they landed on you! 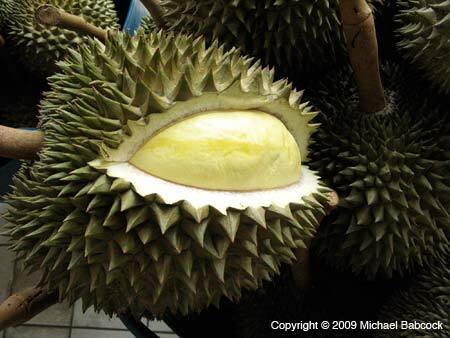 Here in the San Francisco Bay Area we have a number of stores that sell durian. My advice is not to get the frozen variety: the texture of the fruit has changed. Kasma sometimes buys a fresh durian but they are usually expensive: at $5.50 a pound a fruit can cost $40 to $50. We have gotten some good ones, though not as good as the ones in Thailand. 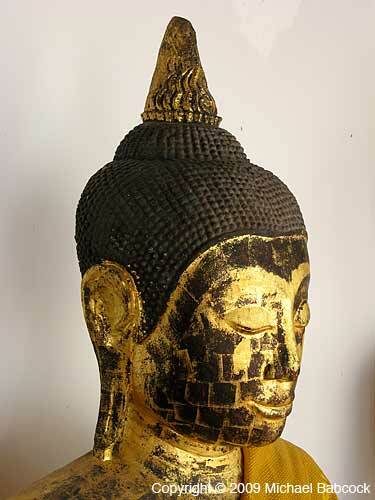 You are currently browsing the Thai Food and Travel Blog blog archives for August, 2009.